Aladdin's Wishes is an Estern theme, 20 payline video slot with wild multiplier Aladdin and scatter Magic Lamp symbols, bonus free spins with 2x win multiplier and random progressive jackpot. All Symbols pay Left to Right except scattered Magic Lamps, which pay Left to Right and/or Right to Left. Scatter wins are multiplied by total bet. Aladdin only appears on reels 2, 3 and 4 and substitutes for all other symbols except scattered Magic Lamps. The prize is doubled when one or more Aladdin's substitute in a winning combination. 4 Girls with Aladdin on activated payline deliver top base jackpot of 10,000x line bet. The Aladdin's Wishes feature is triggered when 3 or more scattered Magic Lamps occur Left to Right or Right to Left. You pick from the 5 Lamps that are revealed. One pick is awarded for each scatter in the trigger combination. If the Magic Lamp is picked it awards 25 free spins, while other Lamps will award coin prizes of 2, 5, 10, 25 or 100 times the triggering bet. Prizes are doubled (2x multiplier) during the free spins feature. The feature can be retriggered on the free spin series. 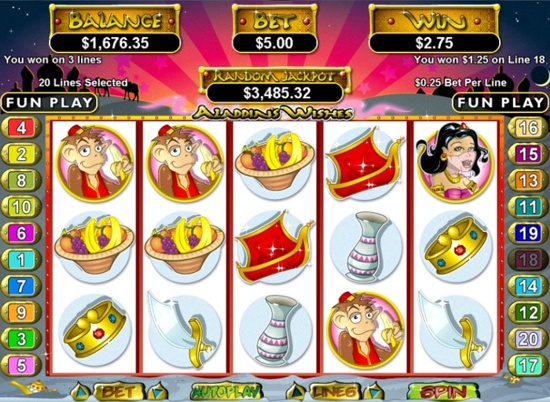 The Progressive Jackpot can be won at random on any paid game. The jackpot win is added to all other line and scatter wins. Uptown Aces - 200% slots bonus up to $1,958, plus up to $8,888 free in bonuses. SlotsPlus casino - $500 free to play over 120 RTG games, US players welcome. Las Vegas USA - Claim your $500 signup bonus, American players welcome. Play all the latest RTG slots - T-Rex & more. Super Heroes HD - Bonus Feature 20 Line Slot from WorldMatch. Viking Legend - Free Spins 20 Line Slot from WorldMatch. Deal or No Deal Slot - Bonus Feature 20 Line Slot from WorldMatch.